Few trees in our eastern forests surpass the grandeur and statuesque beauty of the white oak (Quercus alba). With strong branches, a stout trunk and the ability to provide welcome shade in the heat of summer with its large spreading canopy, the white oak is a ruler of the forest. They can grow more than 100 feet tall and be 15 feet around. 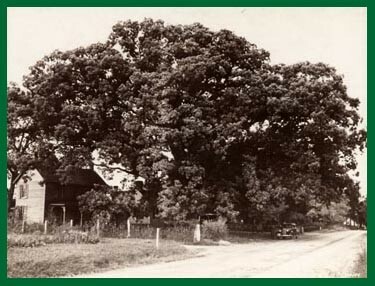 The 19th century sea captain stopping in at the local pub had a connection to the white oak tree: when sealed, the hard, durable wood made strong, water-tight ships and was often used to make the barrels to store and age whiskey and wine. The white oak is consequently also known as the stave oak. According to the Virginia Department of Forestry, the light brown, close-grained wood is also used for furniture, flooring and tools. Anyone who harvests and splits their own firewood can attest to the satisfying way in which white oak logs crack open when hit just right with a splitting maul. Perhaps most famous of the white oaks was the former national champion, the massive Wye Oak in Maryland. It had a circumference of over 31 feet and was believed to have sprouted in 1540. Sadly, a severe thunderstorm toppled the tree on June 6, 2002. The legacy of the ‘venerable monarch’ lives on, however, as the trees’ offspring produce acorns of their own. The new champion resides in Indiana. Ecologically, white oak acorns are highly favored by deer, turkey, bear and squirrels. In a good year, a mature tree produces 10,000 acorns, though good mast years occur sporadically. Its vast arching canopy provides habitat for birds, squirrels, chipmunks and other arboreal dwellers. In fact, at least 36 different kinds of birds consume the acorns. Unfortunately, one forest pest is particularly drawn to the white oak; the gypsy moth favors the deeply grooved, sheeting bark as a perfect place to deposit egg masses. The gypsy moth population is currently low in Virginia though certain forested areas of Page County see higher populations than others. At the back of Jewell Hollow near the boundary of Shenandoah National Park, a large white oak ‘wolf tree’ still bears the evidence of previous years’ gypsy moth egg masses. These so called ‘wolf trees’ – often mature white oak – are those to which gypsy moth are inexplicably drawn. Such trees serve as a beacon, if the gypsy moth are to be found anywhere in the vicinity they will be found on a wolf tree*. When using white oak in landscaping, it is important to allow them plenty of space to grow and thrive. They do well in rich, well-drained areas but also grow in many upland sites. Due to their long lives, they make good commemorative trees. *NOTE: The upcoming Virginia Association of Forest Health Professionals conference (Feb. 3-4, 2014 in Glen Allen, VA) provides an excellent way to learn more about emerging pests, existing issues and other related forest ecology and forest health topics. Timothy Spira, Wildflowers and Plant Communities of the Southern Appalachian Mountains and Piedmont, (Chapel Hill, The University of North Carolina Press, 2011), 256.